Even though the wind is howling and you’re always one good storm away from never forgetting the term “lake effect snow,” winter in Chicago offers a host of wonders, indoors and out. 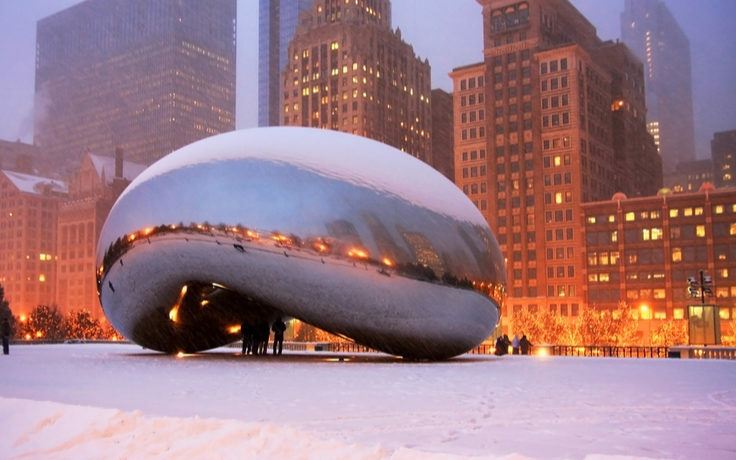 There are too many to choose from, but here are 15 favorite things to do in a Chicago winter. Skating in Millennium Park: The McCormick Tribune Ice Rink began its 18th season in November and skating will continue, weather permitting, through March 10 in the shadow of the Bean, the famous “Cloud Gate” sculpture between Madison and Washington Streets at Michigan Avenue. Skating is free. Skate rentals start at $13. Holiday Tea at the Drake Afternoon tea at Chicago’s venerable Drake Hotel has been a Gold Coast tradition for nearly 100 years. Reservations are always encouraged, but especially so for Holiday Tea, which has seatings every half hour from 1 p.m. to 4:30 p.m. daily from Nov. 1 through Jan. 13. At prices of $52 for adults and $25 for children ages 3-12, enjoy a variety of teas, finger sandwiches and pastries, plus carolers and a harpist, in the room that has hosted royalty from Queen Elizabeth to Elizabeth Taylor. Cubs Convention/SoxFest: Get your baseball fix a month before spring training starts with players, coaches and alumni mingling with fans in autograph sessions, panel discussions and other activities. The 34th Cubs Convention will be Jan. 18-20 at Sheraton Grand Chicago. A weekend pass is $125. The 27th SoxFest takes place Jan. 25-27 at Hilton Chicago. Weekend passes, including hotel stay, start at $385. Eataly: If the best way to chase away the winter chill is with a home-cooked meal, stop first at Eataly, a modern monument to all things Italian at 43 E. Ohio St., to shop in its vast and wildly popular specialty grocery store. And maybe take a cooking lesson. Or let someone else do the cooking at one of five sit-down restaurants on site. Or peruse walk-up counters for pasta, cannoli, pastries, wine, bread or gelato. Free Museum Days: The Museum Campus at the southern end of Grant Park is beautiful any time of year — and with Adler Planetarium, Shedd Aquarium and Field Museum within walking distance of each other and all offering free days, the area should not be missed. At Adler, Illinois Resident Discount Days (Dec. 1, 3-7 and 10 in 2018; TBA in ’19) offer free general admission plus discounts on special attractions). Shedd’s 2018 free days ended in October, but January and February dates are expected to be announced soon. Field has Dec. 16 left on the ’18 calendar and typically has several free days each January and February. Bulls and Blackhawks: Both are typically a tough ticket, but since neither team is enjoying a stellar season, you may have better luck getting lower than the 300 level. Regardless, United Center, just a few blocks from West Loop’s restaurant row on Randolph Street, is a building that buzzes — and if the home team stinks, there are dozens of great food and drink options. Buddy Guy’s January Residency: Guitarist Buddy Guy has inspired players from Jimi Hendrix to Stevie Ray Vaughan. He kicks off each new year with an extended series of gigs at his South Loop club, Buddy Guy’s Legends. Tickets, if you can get them, range from $55 to $70. In 2019, he’s playing 16 dates at the club, 700 S. Wabash Ave., between Jan. 3 and 27. Stroll Boul Mich: Michigan Avenue’s Magnificent Mile runs from the Chicago River to Oak Street — or roughly the Tribune Tower to the Drake — and is home to some 460 retailers, from upscale boutiques to major department stores, not to mention dozens of restaurants and luxury hotels. Always percolating, no matter the weather. Second City: Ground zero for improv comedy in the United States, Second City is an Old Town landmark and incubator for the talents of Joan Rivers, John Belushi, Chris Farley, Steve Carell and Stephen Colbert, among many others. Mainstage Theater and e.t.c. Theater both feature improv reviews. ZooLights: Lincoln Park Zoo is open 365 days a year and is free. Through Jan. 6, from 4:30 p.m. to 9 p.m. daily, the experience is further illuminated by 2.5 million holiday lights. Now in its 24th year, ZooLights features carolers, ice sculpture carving, spiced wine, musical light shows and more. Lincoln Park Conservatory: From 9 a.m. to 5 p.m. daily, this “paradise under glass” offers a tropical respite from the winter chill with lush greenery in its Palm House, Fern Room, Orchid House and Show House. Built between 1890 and 1895, this Victorian-era glass house offers free admission. Deep Dish: The main contenders for the title of best deep-dish pizza in Chicago — the town that invented that style pie — are typically boiled down to a handful of places. Pizzeria Uno, Lou Malnati’s, Gino’s East and Pequod’s are on most lists. Uno’s and Gino’s East flagships are in River North. Malnati’s has locations all over Chicagoland, including Wicker Park, Gold Coast and River North. Pequod’s is on the western edge of Lincoln Park. Maggie Daley Park Ice Skating Ribbon: A serpentine, quarter-mile loop just east of Millennium Park and south of the new east side at Randolph Street and Columbus Drive, the Skating Ribbon offers spectacular skyline views and free skating from November into March. Skate rentals start at $13 and packages including lockers and hot chocolate are available. Polar Adventure Days: On three Saturdays throughout the winter — Dec. 15, Jan. 26 and Feb. 23 — Northerly Island is home to Polar Adventure Days. Among the free events are the opportunity to tour the new Northerly Island Natural Area; see Siberian huskies, wolves and other live animals; explore the island on snowshoes; and make winter crafts. Northerly Island, a man-made, 91-acre peninsula that also holds Adler Planetarium, is the easternmost portion of the Museum Campus. Chicago Auto Show: The nation’s largest auto show runs Feb. 9-18 at McCormick Place, 2301 S. Lake Shore Drive. Tickets are $13 for adults, $7 for seniors and children ages 7 to 12, free for children 6 and under. First staged in 1901, the show occupies 1 million square feet of exhibit space and features virtually every major car manufacturer in the world displaying new and prototype models. Like a commuter trying to scrape his windshield with a paper coffee cup, we’ve barely scratched the surface. Even so, picking off items from this list ought to carry you out of winter and into that other famous Chicago season: construction.